In Nepal, every family is aligned to a temple. It is a very important part of our culture. As a boy, growing up in Nepal, I visited Changu Narayan Temple, Nepal’s oldest Hindu temple in the Kathmandu Valley. It is one of seven World Heritage sites, and what makes it truly remarkable is that it is a living monument – to this day it is actively used by Nepali people as a place of worship and reflection, social congregation, and celebration. Changu Narayan is one of the oldest and most important temples in Nepal since the 6th century AD. For those who haven’t been to the temple or surround village, it really is a beautiful place. The temple itself is, set atop a hill and surrounded by an evergreen forest. It has some of the most wonderful carvings from the Licchavi period. The temple precinct is a thriving community, it is one of the few ancient monuments which is at the heart of a Nepali community and embedded in culture. When I saw Nepal’s monuments damaged in the 2015 earthquakes, I was quite heart broken. It felt like a part of my identity had been destroyed. I think all Nepali people feel this way. I was moved to act. I understood the importance of these monuments to the people of Nepal and the huge loss beyond the bricks and timber. It rocked the core of what it means to be Nepali – our culture, spirituality and national pride. At FONA, we recognised that there was an opportunity for Australia to play a role in restoring one of the monuments. Relations between Nepal and Australia are closer and more important than every before. We have a significant Nepali population in Australia, with a history of people coming to Australia to pursue education or employment opportunities. So we felt it would be a symbolic gesture of friendship and goodwill between two nations with growing economic and cultural ties. That’s why FONA decided to lead the charge and lobby the government and forge partnerships to collaborate with and connect aligned projects on the ground in Nepal with Australian institutions, like Macquarie University. We are collaborating with heritage architect, John Sanday, who has been in Sydney supporting FONA to raise awareness of Nepal’s heritage particularly Changu Narayan. For those who don’t know John, he is renowned in his field, having consulted on some of the biggest global restorations, such as Angkor Wat in Cambodia. Living and working in Nepal for more than 40 years, John is incredibly passionate and knowledgeable about Changu Narayan. Since the 2015 earthquake, he has worked alongside the community of Kathmandu Valley with the aim of restoring the temple. On Friday night, we had the pleasure of hearing John speak at a Macquarie University lecture to students, academics, architects and the general public interested in Nepal. One of the reasons why we are so delighted to be working with John is because he sees the opportunity of creating a project around Changu’s reconstruction which not only rebuilds the temple but looks at opportunities for long term conservation, such as through training programs. We are also looking at fostering collaboration between Australia and Nepal to exchange skills and knowledge in areas such as heritage conservation, archaeology, marketing, media and town planning. There is an immense opportunity to learn from each other. To me, I see this a project with the potential to be a model example of heritage conservation not only in Nepal but for the world. Much of the focus post-earthquake has been on rebuilding of homes, hospitals and schools, which is understandable. But monuments like Changu Narayan are a vital part of the social fabric of Nepali society. The work we are doing is very symbolic of hope and national pride. In these villages, some people would place higher importance on having their temple than on having a beautiful new home. FONA understands that it is vital to address these needs as well. Through this project we will not only be restoring the temple, but the homes and businesses of the precinct, while creating training opportunities for local people to learn how to rebuild their own homes. For the people who live in the community or rely on Changu Narayan, it means they can once again have their place of worship and congregation. This will provide people comfort and hope. For local industry, it’s an opportunity to revive tourism and local businesses and become more sustainable. Our project includes components such as training tour guides, promoting unique handicrafts of the area, and developing beneficial agricultural schemes, to help rebuild livelihoods. For tourists, they can experience a traditional Newari settlement and witness the beauty of an ancient living monument, gaining a deep insight into Nepali culture. With some focus on marketing, the community will attract more tourists and leverage their strengths. For architects, anthropologists, scholars or historians, they can participate in an innovative approach to restoring a living monument, post-earthquake. The site can become a remarkable destination for researchers and scholars and a successful religious and cultural centre. For the world, it means that a monument of great historic and artistic significance is preserved for future generations to enjoy. These are only some of the opportunities – there are many more. There is a unique opportunity for Australia to play a role. We believed this from the moment the earthquake struck. But last year we uncovered a historical connection between Australia and Changu Narayan, dating back to 1986. At that time, a group of Australian architects from Sydney Institute of TAFE visited Nepal to survey the temple and village complex, and document the site in a set of architectural drawings . This connection formed the basis of a FONA-led collaborative reconstruction program between Australia and Nepal. So FONA, together with the architects, presented the architectural drawings to the Prime Minister of Nepal to assist with the site’s reconstruction. With the support of the Prime Minister of Nepal and UNESCO, we’re building on this relationship by connecting Australian expertise to Changu Narayan and seeking financial and non-financial support from the Australian Government and others to support reconstruction efforts. We will keep you updated as the project progresses. Thank you for your support. 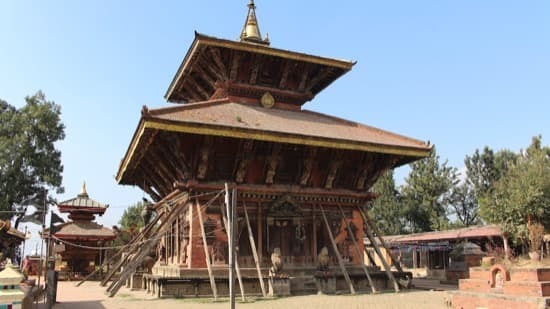 Saving the heritage of Nepal: recovery and restoration after the earthquake was supported by the Faculty of Arts at Macquarie University, in collaboration with FONA.